Kati Meyer-Brühl is something of a specialist when it comes to people's needs. It's in her DNA to constantly analyse these needs as she goes about her everyday life, during an evening at the cinema or whilst she is out jogging, for example, or during her travels all over the world. Keen powers of observation are a vital ingredient. Kati Meyer-Brühl studied at the world's leading design schools in Dessau, Gothenburg, Copenhagen, London and also New York. She now lives in Berlin but grew up in the countryside in a quiet, densely forested area in the middle of nowhere close to where the border between West Germany and the GDR once divided Bavaria and Thuringia. Her pieces of furniture are the quintessence of her experiences. She reworks established design approaches in a daring and courageous way and also produces original and innovative creations. Kati Meyer-Brühl became extremely sensitive to nature at a very early stage of her career and her designs reflect this heightened awareness. Right from the start, each piece of furniture is designed with sustainability in mind and manufactured to the highest environmental standards from eco-friendly materials only. In keeping with the motto "less is more", she is determined to contribute to the conservation of natural resources by designing furniture that is as universal and as adaptable as possible. It therefore looks as good in an urban loft apartment as it does in a lakeside cottage. "Design should benefit people," is Kati Meyer-Brühl's credo. "My designs are intended to be lifelong companions. That is why they have to be flexible and adapt to a wide range of needs. They should still appeal to their users in fifteen years' time and, of course, they should also still be comfortable to sit on all those years later." The designer is not a fan of huge sofa landscapes as she believes they simply do not suit most people's lifestyles. Kati Meyer-Brühl's furniture, on the other hand, integrates easily, can be moved around and can also be added to. She tends to focus on diversity and non-fixed interiors, rather than uniform ranges. 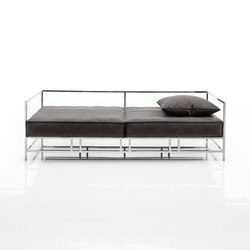 Kati Meyer-Brühl's easy pieces metal sofa is the embodiment of her ideological and design maxims. It was inspired by the idea of a conceptual return to the fundamental components of a sofa: a frame and upholstered elements. easy pieces metal combines these two components in the simplest imaginable and most transparent way by ensuring that the basic structure remains visible. 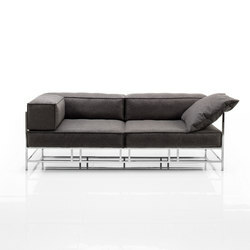 A graceful metal frame serves as the basis and holds loose, ether soft or firmer, cuboid upholstered elements. easy pieces metal not only reveals the usually hidden structural parts but actually emphasises their decorativeness, despite its rather understated looks. However, Kati Meyer-Brühl wouldn't be the multi-award winning designer she is if this apparent simplicity was not the result of a meticulous design approach. 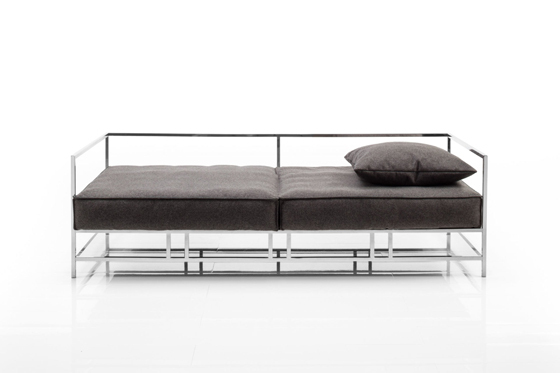 easy pieces metal's strong impact is therefore due precisely to this "simple" contrast between voluminousness (the upholstery) and gracefulness (the frame). The reduced design emphasises the colours and properties of the material used for the frame and the upholstery textures even more strikingly. This approach also makes it possible to create a wide range of very different effects through customised combinations, from extremely elegant to natural. Ultimately, the reduction also serves as the background that makes the aesthetics of the craftsmanship come to life. Both the "soft" and the "compact" upholstery versions offer outstanding comfort. 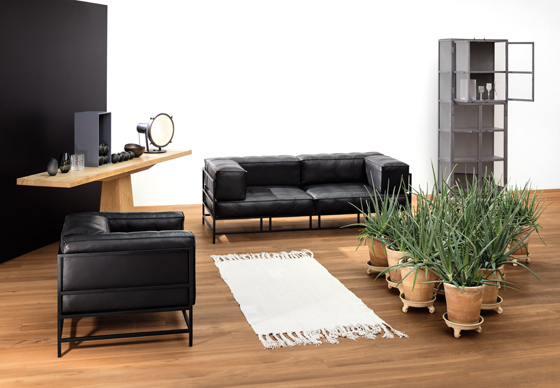 easy pieces metal comes with removable covers, which increases the in any case already long product lifespan – a trademark of all brühl furniture, by the way – even more. Changing the covers is easy. 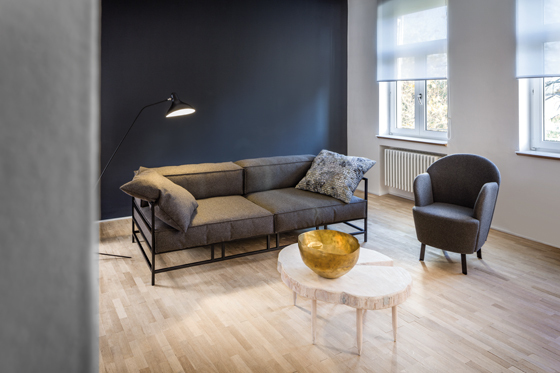 In view of today's often frequent lifestyle changes that might include anything from a move from a shared apartment into a generously-sized period flat or a tiny house, from the city to the country or vice versa, this option of being able to completely alter the look of the sofa is certainly another one of its advantages. Fabric covers can also be replaced by leather covers at a later stage. 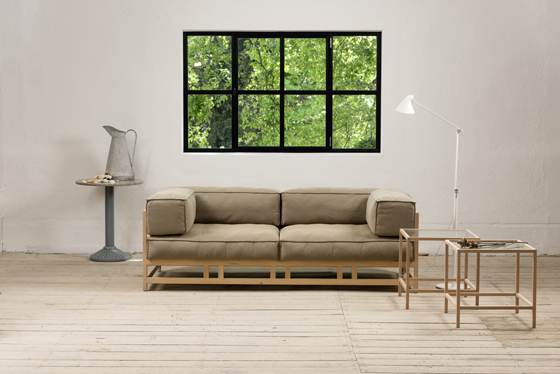 People that are particularly aware of their own responsibilities when it comes to living sustainably, for example, can choose between numerous fabrics that comply with the Oeko-Tex® standard or Oliva leather, which has undergone a purely plant-based tanning process with olive leaf extracts and is therefore particularly eco-friendly. 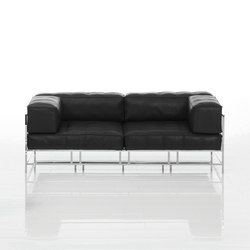 easy pieces metal also offers another advantage that almost all of the designer's pieces offer: easy convertibility. It takes only a second to remove the side and backrest cushions to thereby turn the sofa into a comfortable daybed or an occasional bed for guests. Of course, the sofa can also simply serve as a bed every night, if need be. 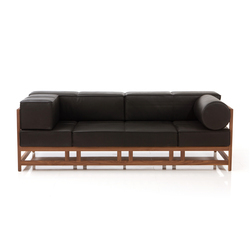 The high-quality upholstered elements are designed to withstand everyday use. easy pieces metal has slats integrated into the seat base. Some people may consider this a design gimmick, but the graceful, open frame looks simply amazing with the upholstered elements removed. Easy pieces metal is complemented by another version of the same design, easy pieces wood, where the frame is made not from metal but from solid wood – either beech, oak or walnut – from sustainably managed forests. Brühl has been a “Blue Angel” eco-label manufacturer since 2009 (only particularly eco friendly manufacturers may use this label), and has been a carbon neutral manufacturer since 2017.